Depart London’s Victoria Station on board the British Pullman and travel through the Kentish countryside. After your Channel crossing board the blue and gold carriages of the Venice Simplon-Orient-Express for your journey through Northern France, arriving in Paris Gard de L’Est in the evening. Embark on the British Pullman at London's Victoria Station and travel through the Kentish countryside. After crossing the Channel board the blue and gold carriages of the Venice Simplon-Orient-Express for your overnight journey throughout France and into Switzerland. Enjoy your day on board as the train travels through the towering Swiss Mountains and Austrian Alps before an early evening arrival in the magnificent city of Venice. Embark on the gleaming carriages of the British Pullman at London’s Victoria Station and travel through the Kentish countryside. After the Channel crossing board the Venice Simplon-Orient-Express for your overnight journey throughout France and into Switzerland. Enjoy your day on board as the train travels through the towering Swiss Mountains and Austrian Alps before an early evening arrival in the magnificent city of Venice. 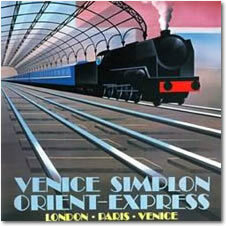 You then have two days at your leisure in Venice before returning to London aboard the Orient Express.